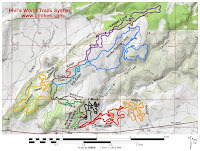 Bob's Loop and DRB ESB are located in the Phil's World Mountain Bike Trails System near Cortez, Colorado. The actual route that the trail named Bob's Loop takes on the official map of Phil's World isn't exactly clear so for this post what we are covering is what is labeled Bob's Loop combined with Here for More and DRB ESB. 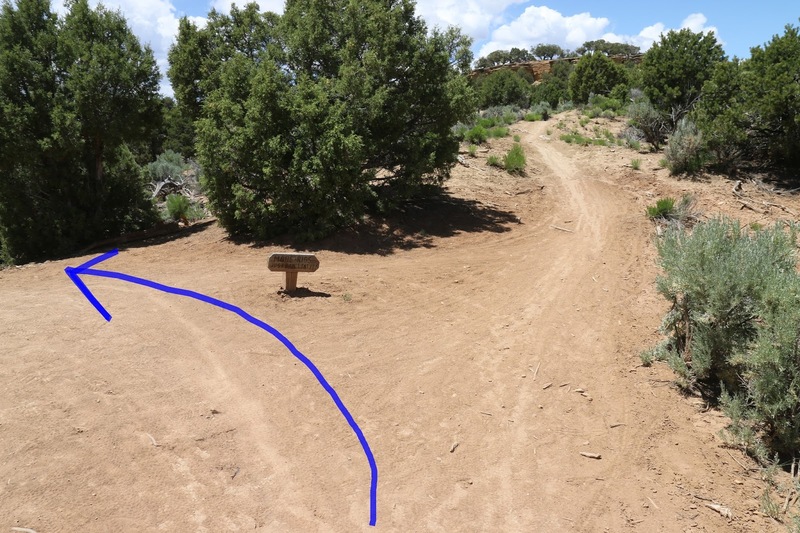 The way this combo is laid out it makes up the return route to the trailhead for all the other trails on the north side of the system except for 2-More. 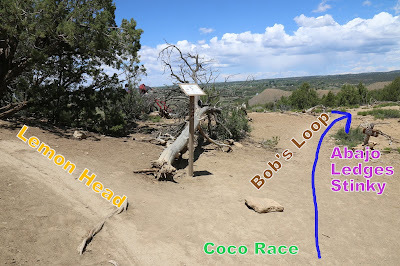 Bob's Loop begins 2.4 miles from the trailhead at the top of Coco Race. Follow the signs for Abajo, Ledges and Stinky. As the trail gets going there is a nice little mound that you can either catch some air on or simply roll on over it. The first sign that says anything about Bob's Loop comes up a little further after the trail gets going across the ridge. 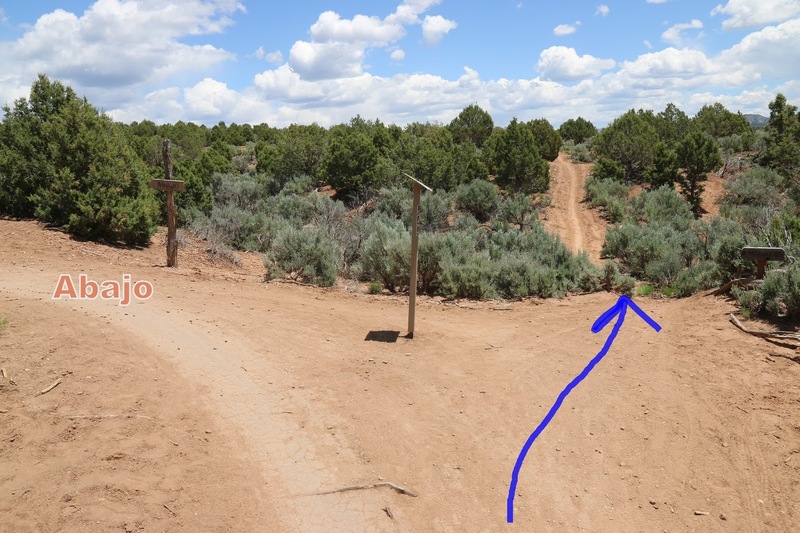 After 3 tenths of a mile the Abajo trail branches off on the left. Bob's Loop continues on a short segment that is marked by a sign that reads 'Pass on Ribs'. Pass on Ribs continues heading east with a little dip that is followed by some fast moving dirt track. 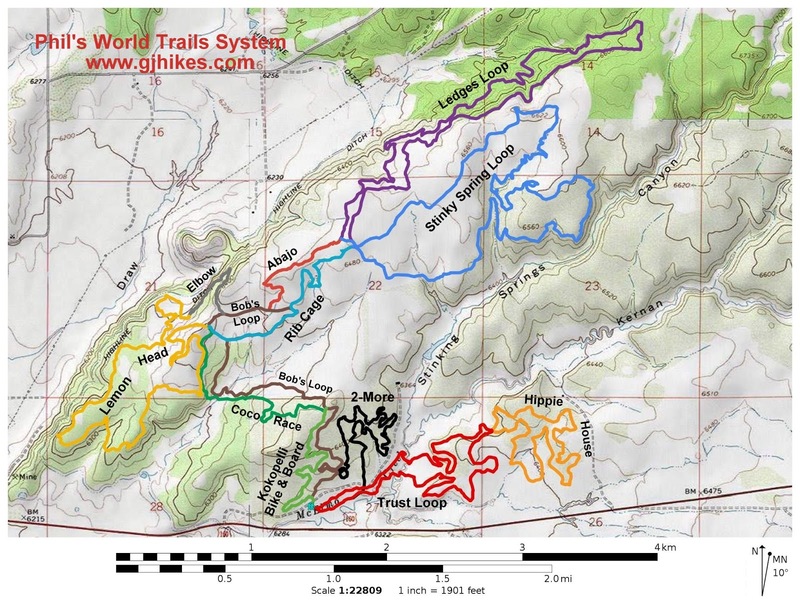 At the 0.4 mile point the trail runs into Rib Cage and begins sharing routes with it. It's probably not possible to get too much of Rib Cage so a little time across the lower part of it breezes right by. At the 0.8 mile point we hook a left onto the 'Here for More' trail segment. If you take the right fork you will quickly end up at the start of Bob's Loop where this post began. Here for More heads mostly downhill back toward the trailhead. There are some nice little hills that come up as the trail cuts across the sagebrush flats and busts through a wash.
On the other side of the flats the trail gets back into the trees and transitions to the DRB ESB trail segment that leads up and over the hill for the final stretch. This is some pretty good trail to finish up any day on. As the trail descends the south side of the hill a switchback drops it around a rocky ledge. One final temptation to ride a couple more miles before reaching the trailhead comes up when the 2-More trail branches off on the left about a quarter mile from the finish. The trail comes to an end across the gravel road from the trailhead when it runs into the Kokopelli Bike & Board trail. This post was kind of a catch-all to pick up the final trail segments in Phil's World that everyone will end up having to ride in this part of the trail system to get back to their vehicles. If you haven't been to Phil's World yet then you are in for a real treat when you do get there. For those that have been there then you can show your friends where you have been playing around at. If you would like to see it for yourself then all you have to do is grab your bike or 'Take a hike'.